In the world of high-end luxury, automobiles, fashion apparel and wristwatches have several elements in common: Each is highly coveted throughout the globe; each features premium craftsmanship and materials and each is considered a symbol of status. 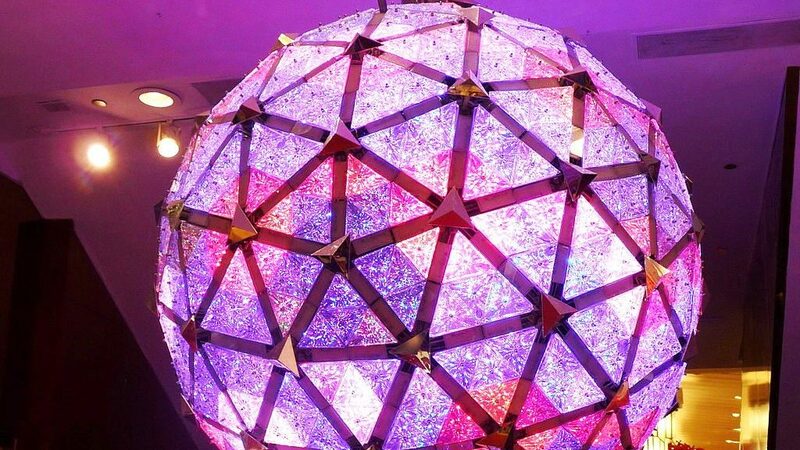 What’s more, many luxury automakers, fashion designers and watchmakers offer more moderately priced divisions in addition to their top-of-the-line high-end brands. Luxury carmakers Lexus, Acura and Infiniti are higher-end divisions of Toyota, Honda and Nissan respectively. Prominent fashion designers Ralph Lauren, Michael Kors, Donna Karan and Marc Jacobs have their eponymous premium lines as well as more affordable labels, Chaps, Michael by Michael Kors, DKNY and Marc by Marc Jacobs. For generations prestigious watchmaker Omega offered the more moderately priced Tissot watch brand, prior to when the two became part of the Swatch Watch Group in 1983. 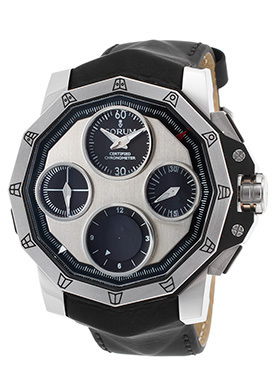 Bulova watches has its namesake brand as well as higher-end Bulova Accu-Swiss division and more moderately priced fashion line Caravelle NY. 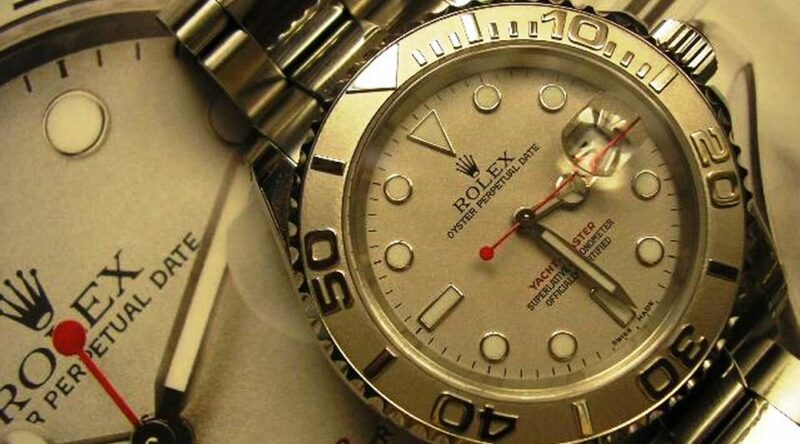 Luxury watchmaker Rolex founded in 1905 by Hans Wilsdorf and Alfred Davis, started production of Tudor Watches in 1946 under Wilsdorf’s direction to offer Swiss-made watches with the reliability, dependability and quality of Rolex watches at more desirable prices. 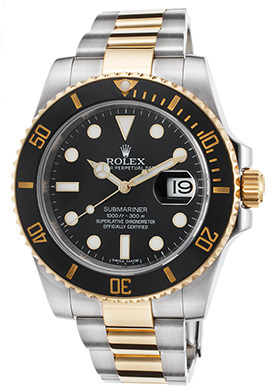 You’ll find an impressive assortment of both Rolex and Tudor wristwatches at TheWatchery.com, including highly sought-after styles from Oyster Datejust, Yacht, Datejust Turn-O-Graph and Monarch collections. Tudor Monarch men’s and women’s watches feature the premium craftsmanship and materials you’ve come to know and appreciate in Rolex timepiece at considerably lower price-points. 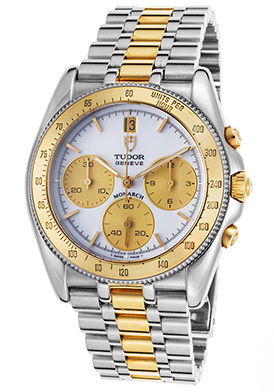 The Tudor Monarch Chronograph makes a statement on the wrist in premium grade stainless steel and 18K yellow gold. 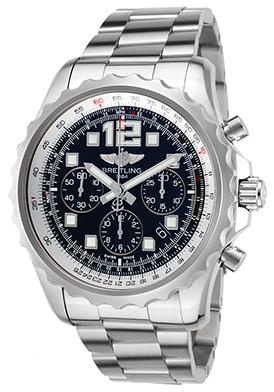 The contoured round case in premium grade stainless steel has a lustrous polished finish. The multi-link bracelet in polished stainless steel is accented with polished 18K yellow gold center links. 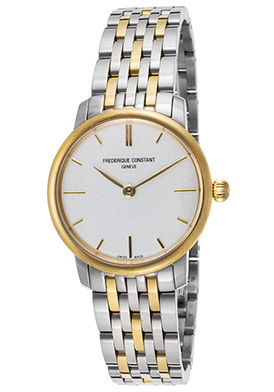 The stationary stainless steel bezel has an 18K yellow gold top ring and fluted edge rim. 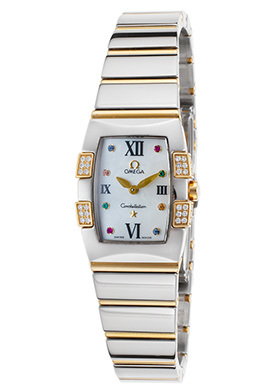 The bright white dial shines with gold colored sub-dials, luminous gold tone baton hands and baton hour markers. Features include small-second, thirty-minute and 12-hour registers. 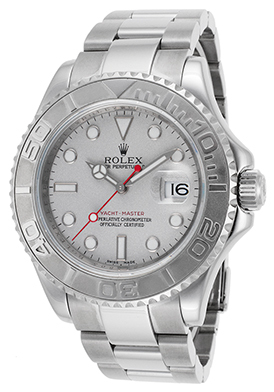 Additional features include premium Swiss-made quartz movement inside, a scratch resistant sapphire crystal above the dial, along with a locking screw-down crown and case back for water-resistance to 100 meters or 330 feet. 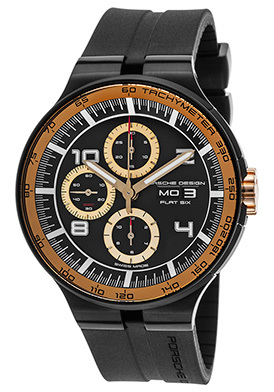 The Tudor Monarch men’s chronograph is 35mm in diameter and 10mm thick. 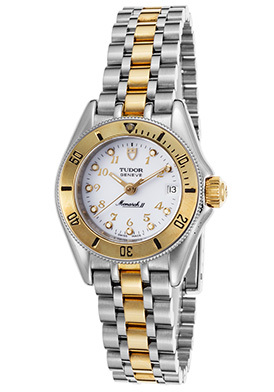 Majestic and appealing, the Tudor Monarch women’s watch makes a regal statement in premium grade stainless steel and 18K yellow gold. 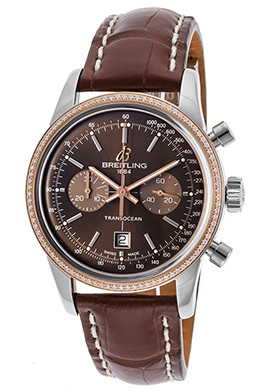 The round premium grade stainless steel case is highly polished to a mirror-bright patina. The case is beautifully integrated into the multi-link bracelet in brushed stainless steel with polished 18K yellow gold center links. Decorative fluted detail accents the perfectly round 18K yellow gold bezel and 18K yellow gold crown. The highly legible white dial features luminous yellow gold tone hands and raised yellow gold tone Arabic numeral hour markers. A window at the 3 o’clock hour reveals the automatic date calendar. 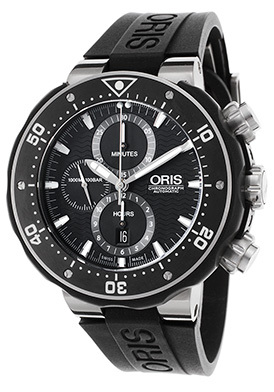 Features include a scratch resistant sapphire crystal above the dial and premium Swiss-made quartz movement inside for precise time-keeping accuracy. 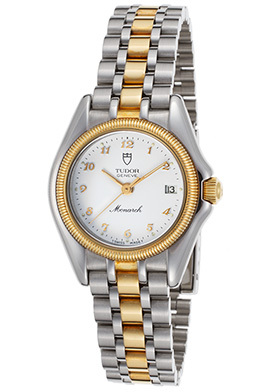 The Tudor Monarch women’s watch is 27mm in diameter and 8mm thick. 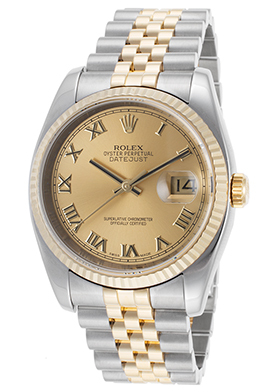 In a league of its own, the Rolex Oyster Perpetual Datejust Men’s watch offers peerless precision and design. This exemplary crafted men’s timepiece has been awarded official Chronometer certification from the COSC (Official Swiss Chronometer Test Institute). The signature Oyster case in premium grade stainless steel is highly polished to a lustrous glow. 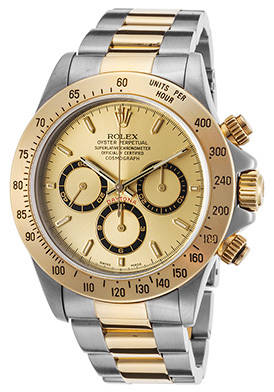 The signature Rolex Jubilee bracelet in brushed stainless steel features polished 18K yellow gold center links. The signature 18K yellow gold bezel with fluted detail surrounds the metallic yellow gold colored dial with polished yellow gold-tone hands and raised Roman numeral hour markers. A magnified cyclops window at the 3 o’clock hour reveals the automatic date calendar. 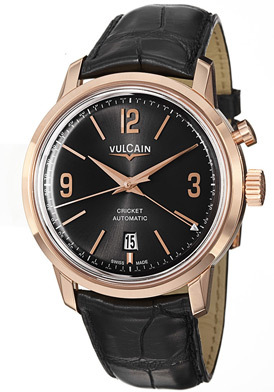 Features include a scratch resistant sapphire crystal above the dial, precision Swiss-made automatic movement inside and water-resistance to 100 meters or 330 feet. 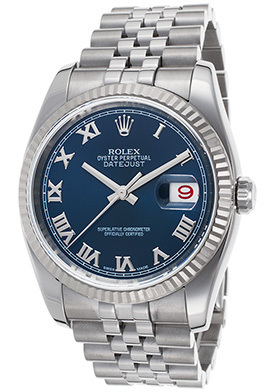 The Rolex Oyster Perpetual Datejust Men’s watch is 36mm in diameter and 12mm thick. 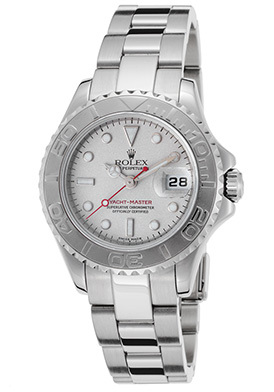 Understated elegance triumphs with the Rolex Yacht Master women’s watch. The signature case in premium grade stainless steel is highly polished to a lustrous patina. The triple-link bracelet in premium grade stainless steel features satin finished outer links and polished center links. The unidirectional rotating platinum bezel features U-notched detail on the outer rim and raised markers on the top ring. The silver colored dial shines with a magnified cyclops date window at the 3 o’clock hour, luminous pie-cutter hands, outlined baton and cabochon dot hour markers. 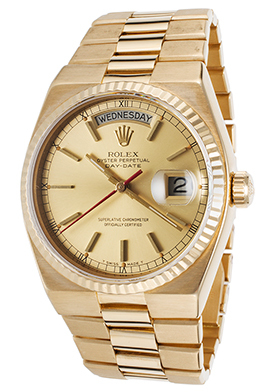 Rolex watch image courtesy of Wiki Commons. 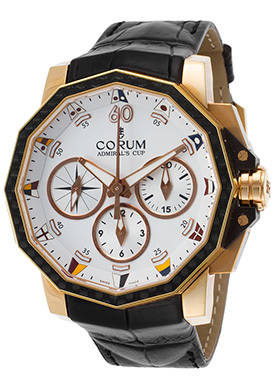 For many of us a luxury wristwatch is more than a precision crafted timepiece. 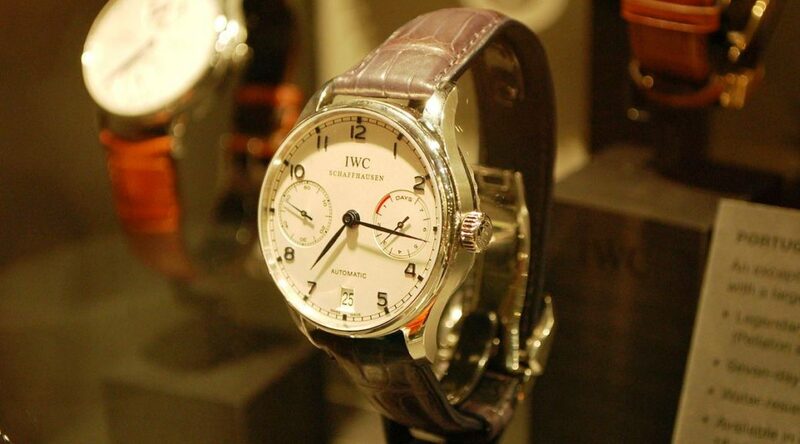 Like a fine European automobile, a high-end watch is also a symbol of success. Also like a prestigious automobile, you don’t have to purchase a costly and expensive brand new timepiece to enjoy the status and prominence of having one. 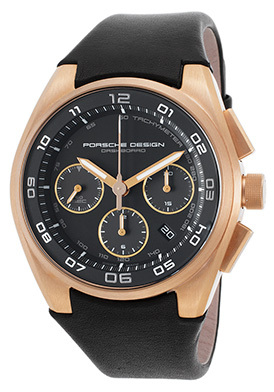 At TheWatchery.com our pre-owned and store display watches make owning a high-end timepiece an affordable reality. Many of today’s most highly sought-after names in luxury horology are featured in our Estate and Store Display collection, including Rolex, Cartier, Raymond Weil, Hermès , Gucci, Jaeger-LeCoutre, Baume & Mercier, Corum, Omega, Maurice Lacroix, Oris, Alpina, Bell & Ross, Chanel, Porsche Design and more. What’s more the price tags of these prominent timepieces are considerably less than their brand-new counterparts and we at TheWatchery.com provide information regarding the condition of the watch, noting any flaws it may have, as well as if the watch comes in its original box with original paperwork. Although an original manufacturers’ box may be appealing to look at, it may also take up too much space. I personally store my collection of watches in several lined multi-watch boxes, making it easy for me to decide which one to wear for a specific occasion. My automatic watches are stored in watch winders to keep them running optimally when not in use. Even though a watch manufacturer’s manual is necessary to have when purchasing a watch, you can easily download a copy to review on the watchmaker’s website. 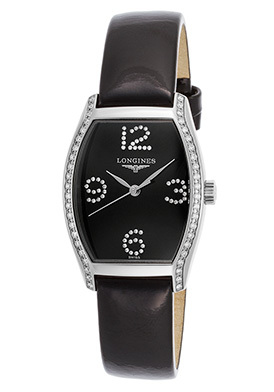 The Hermès Vintage women’s watch is excellent Store Display selection. 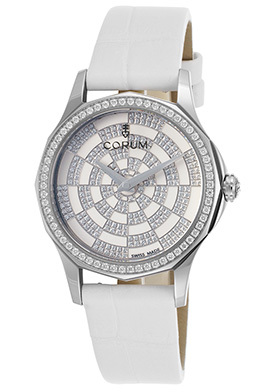 This graceful and elegant women’s strap watch features the rectangular shaped case in premium-grade stainless steel, highly polished to a mirror-bright glow. The case is presented on a crocodile-textured black leather strap with a deployment clasp buckle. 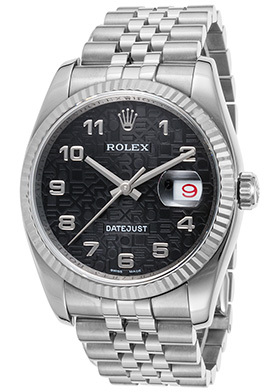 The polished stainless steel bezel looks like a belt with a stationary tongue accent on top. The chevron patterned silver-colored dial shines with polished silver-tone sword hands and raised square quarter hour markers. 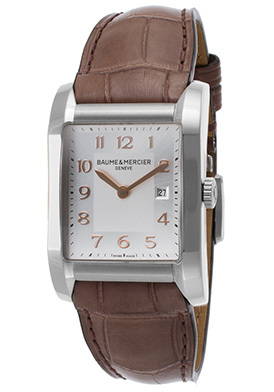 Features include a scratch resistant sapphire crystal above the dial and premium Swiss-made quartz movement inside. 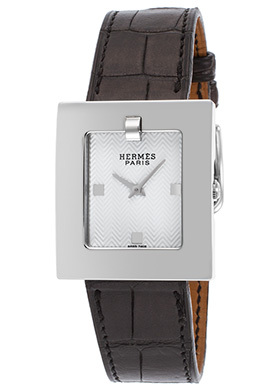 Minor scratches on the case back, a slight discoloration of a strap and slightly worn details on the strap are items to take into consideration with Hermès watch, which is 26mm wide and 7mm thick. 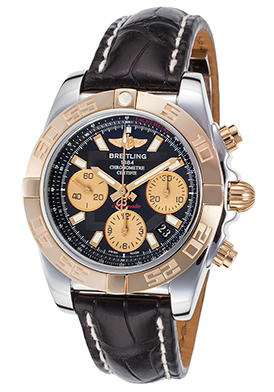 Many highly coveted prestige watches are no longer in production and a pre-owned one may be your best if only option. 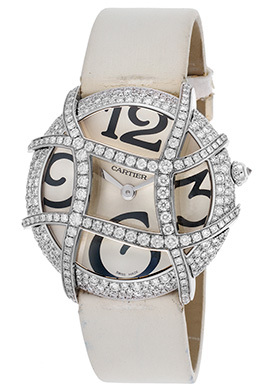 This especially holds true with the Cartier Pre-Owned Libre Diamond watch. 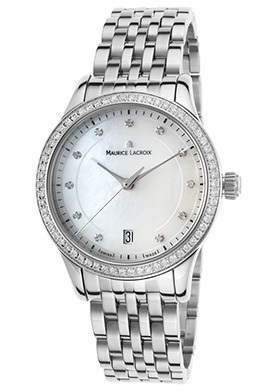 Beset with glamour and brilliance, this breathtaking women’s watch from the brand’s Haute Jewelry series features hundreds of shimmering round-cut diamonds, pave-set on the raised grille-design bezel in lustrous 18K white gold. The perfectly round case in lustrous 18K white gold is presented on a white satin-facing leather strap with a tang buckle clasp. 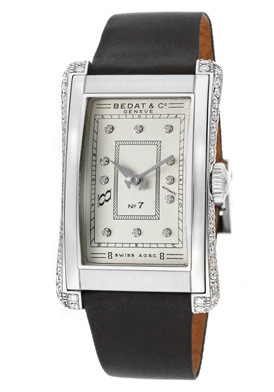 The silvery-white dial shines with polished silver-tone hands and highly stylized black Arabic numeral hour markers. 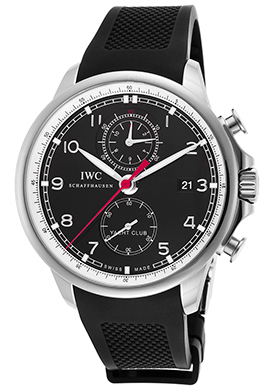 Features include a scratch resistant sapphire crystal above the dial and premium Swiss-made quartz movement inside. 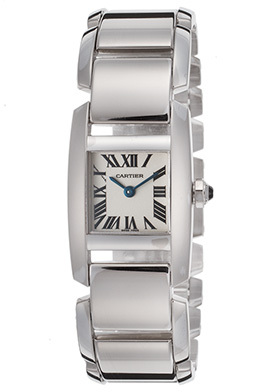 Cartier Libre women’s watch is 37mm in diameter, 9mm thick and is water-resistant to 30 meters or 100 feet. 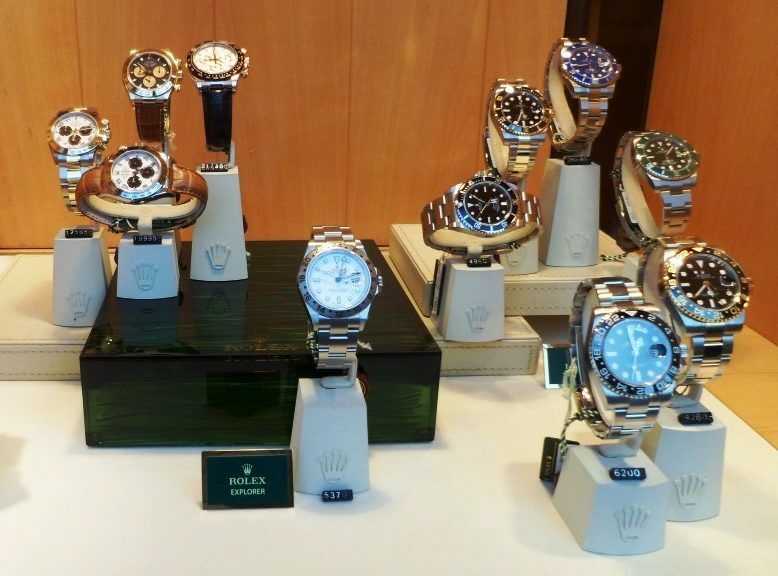 Rolex is by far one of the most sought-after Pre-Owned watchmakers, since brand’s timepieces hold their value the best. 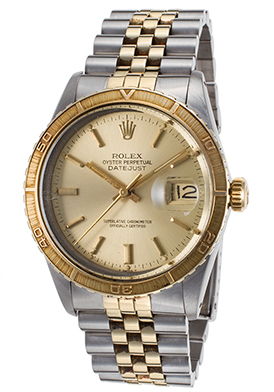 The Rolex Oyster Perpetual Datejust Automatic men’s watch is an exceptional choice in premium-grade stainless steel and 18K yellow gold. The signature Tonneau-shape Oyster case in polished stainless steel is presented on the Jubilee bracelet in satin finished stainless steel with 18K polished yellow gold center links. The signature fluted 18K yellow gold surrounds the yellow gold colored dial with a cyclops date window at the 3 o’clock hour, polished gold-tone hands and raised Roman numeral hour markers. 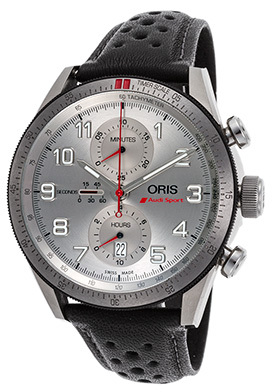 Features include a scratch-resistant sapphire crystal above the dial along with a screw-down crown and case back for water-resistance to 100 meters or 330 feet. Rolex men’s watch is 44mm in diameter, 16mm thick and has been awarded Chronometer Certification from the esteemed COSC (Official Swiss Chronometer Test Institute). 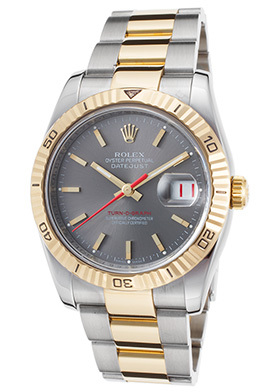 Although this Rolex pre-owned watch comes in pristine condition, the bracelet on this watch is now only 7-inches long and was probably sized by the previous user and will not fit wrists any larger than 7-inches round. It is always best to take the bracelet size into consideration when purchasing a pre-owned watch, since additional bracelet links may not be readily available and the watch will only fit wrists the same size or smaller. 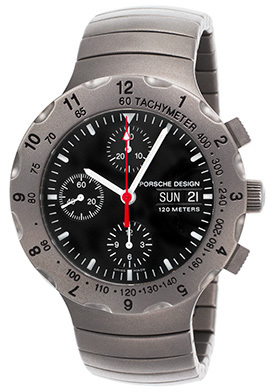 Each Pre-Owned and Store Display watch at TheWatchery.com comes with a 2-year limited warranty. Each is backed by our 30-Day return policy – if you are not completely satisfied with your pre-owned watch purchase, you can return it within 30 days.